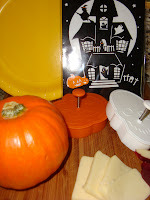 Mystery Lovers' Kitchen: Trick or Treat! Say Cheese!! Trick or Treat! Say Cheese!! Don't have a Halloween Meltdown...have a Halloween "Melt"!!!! This week, all week, we're offering fun Halloween recipes and stories. Leave a comment each day, and you could win one of the unique gifts. What do you give those little monsters before Trick or Treat? You know they want candy so badly they're salivating, but you want them to eat a meal. How about grilled cheese? But not just any grilled cheese. A mini-gourmet sandwich that looks fun to eat and takes incredible. I purchased some Halloween cookie cutters at Williams Sonoma and thought what fun it would be to make grilled cheese sandwiches that looked like pumpkins or skeletons. However, when I was cutting the bread with the cookie cutters, I wasn't so sure I had a good idea, after all. The inside of the cookie had a press, and when I pressed on the bread, I didn't really see the pumpkin face impression or the skeleton's eyes. They looked too plain, and it wasn't like I was going to decorate with orange sprinkles to doll them up the way I would a cookie. But I decided, what the heck? I was already this far with my experiment, so I proceeded. Well, when I grilled the bread, the impression came to life, as it were. Not super scary, but good enough. This is a fun meal for the kids to prepare. Something to take their minds off hitting the streets and marauding around the neighborhood. What made these grilled cheese really tasty was the cream cheese added to the other three cheeses. That's right, four cheeses in this recipe. The cream cheese melts beautifully and has a slight tartness that enhances the flavor of the other cheeses. Heat a saute pan or griddle. Butter one side of each piece of bread. Lay one piece, butter side down, on the hot pan. Top with Monterey Jack slices. Cook three to four minutes until golden brown. Meanwhile, on the other piece of bread, spread cream cheese. Sprinkle with herbs. Place that slice of bread on the hot pan, butter side down. Top with shredded cheeses. Take Monterey Jack half of sandwich and place cheese side down on the shredded cheeses half. Cook three to four minutes until golden brown. Turn off heat and cover the sandwich. Let it stand on the heat for another three to four minutes to insure that the cheese melts. Remove with a spatula and serve. By the way, this makes an elegant "adult" grilled cheese as well. If you'd like to know more about The Long Quiche Goodbye and want to download a few other recipes from me (on recipe cards), click on this link to my website: Avery Aames. I've posted recipes in the "morsels" section. There's lots of other fun stuff, as well. And sign up for the fan club to get in on the next contest...coming soon. Sounds really good and the sandwiches turned out cute. Thanks, Lisa. Aren't you up early! As you can imagine, we eat a lot of grilled cheese around here. :) But--none with cream cheese! I think my kids will love this...thanks! Wish I qualified to win the luminaries--so cute! Those sandwiches turned out really cute. I don't have kids but I think my husband would even appreciate a halloween themed grilled cheese sandwich!! Grilled cheese that gives you chills! Love it! Those haunted house luminaries are a great prize, too. Good luck to everyone leaving comments! You are SO good. I was totally, totally guilty of the boxed Mac & Cheese -- with cut up raw veggies on the side -- before the T&T commenced. There's nothing better than a good grilled cheese with some bread and butter pickles on the side. Yum! I just felt an artery clog with joy just from reading the recipe. Seriously. Will definitely have to try that one -- thanks! Such a great idea! The kids will love these!! Wow, Avery...I don't care whether or with what they're cut, those sandwiches look irresistible! Note to self: Buy Gruyere today. Hi Avery, knowing that you always have alternate ideas... I'm sure you wont mind if I use what's in the fridge. I have either white or yellow cheddar, Gouda, pepper jack an asadero. I'll try those and let you know how that combo works out. What a great way to open Halloween week here, Avery! I've been off the grid again for a couple of days and now playing catch up. What a great recipe to open up this morning! Looks fabulous. Now I can't wait until lunch! Avery, they're so cute! Love those spooky faces. And the grilling only seems to accent the sinister looks. What fun! Love these! Halloween is one of my favorite times of year - and I love to make spooky recipes for all my little goblins. Can't wait to try this one! The sandwiches look great. And the recipe...MMMMM...Thanks so much. Nora, let me know about the other cheeses! Fun to experiment. So glad everyone is enjoying this. Yes, "little goblins" should adore. Wow, not your grandma's grilled cheese sandwich! Bet it would be super tasty with tomato and/or bacon on it. Nurse Judy and Trek, I made a bacon and cheese sandwich on raisin bread and shared it in a recipe last year. It's pretty yummy, but then I've got friends who say bacon on anything makes it taste better. Now I want a four-grilled cheese for my dinner tonight. Perhaps tomorrow.